He is perhaps the most ridiculed soccer player in the Dutch Eredivisie: Lex Immers, likely on loan to Cardiff City in Wales as of today. If we are to believe his many critics, the Feyenoord midfielder can’t pass, can’t control the ball, and can’t finish. All he can do is tackle and run, which the Dutch rank just slightly above turning up for the match on time. Is this reputation deserved? In March 2014, Sander IJtsma and I looked at some basic metrics and found that no, Immers was decidedly not an amateur who somehow managed to con Feyenoord into buying him. His status this season is harder to assess, given his limited playing time. But it’s safe to say Immers will always be better than he looks. Why notorious klutz Lex Immers is actually one of the nation’s best soccer players. Or was. If you want to assess Feyenoord midfielder Lex Immers as a player, there’s one thing you should never do: watch him play. Immers on the soccer field is not a pretty sight. There are simply too many distractions. There’s that awkward run, the flailing limbs, the clumsy tackles with those scrawny white legs, and of course the middle finger he treats us to on special occasions. Then there are the aggressive grimaces, the balls that seem to spring uncontrollably away from his feet, and what is likely the cheapest haircut in the league. He pales in comparison to his elegant teammates. The contrast is most pronounced with top scorer Graziano Pellè, who unfortunately for Immers is often found nearby on the field, so the television cameras frequently catch them both in the same shot. While Pellè looks like he just stepped out of a Michelangelo fresco, Immers most resembles a sun-deprived video game addict with an advanced vitamin deficiency. But perhaps the most striking element of Immers’ game: the balls he kicks past the goal, over the goal, way over the goal, and way way over the goal. It seems to happen at least once every match. It also happened in the January 2014 match against archrival Ajax. Some seven yards from the goalline, the ball landed near Immers, who then took a left-footed shot, contacted the ball wrong, and missed. And a year before, he didn’t do much better. Typical Immers. It should come as no surprise that Immers’ reputation with both spectators and the press comes down to that of an incompetent shot misser (or a competent shot misser, depending on how you look at it). A column from last September on the Dutch sports website NuSport The NuSport column on Lex Immers can be found here (in Dutch) sketches the situation as follows: "Lex is permanently at war with the ball (the thing never listens to him), Lex misses at least four chances every match in the category My Mother-in-Law Could Have Made That Shot, Lex is caught off guard by his own feigned moves, and Lex’s hair (certainly in comparison with Pellè‘s) looks like it was trimmed with a lawnmower. How he was ever allowed to don Feyenoord’s coveted number 10 jersey remains a mystery." The negative framing is so pervasive that even good plays are cast in a bad light. In a 2014 match against Roda JC, Immers converted a true longshot Watch the goal here of an opportunity into a goal, which the commentators then described as follows: "And again he’s managed to rack up a respectable number of goals this season." The subtext? Not bad for a lousy player. In short, it would seem that Lex Immers, now 29, will never be able to shake his image of being a poor player. And that image is completely unjustified. The problem is that Lex Immers is a deceptively good player. His weaknesses or supposed weaknesses are much more prominent than his strengths. If you want to assess his game, don’t go watch him play. Instead, take a good look at his stats. Until recently, that would not have been much use. Data was available – on passes, shots on goal, headers – but difficult to interpret. Take passes, for instance: If a defender makes dozens of safe passes back to his keeper, he generates fantastic pass statistics, adding many completed passes to his name. But has he helped out the team? Hardly. But now the data is easier to interpret. An international community of data-loving soccer bloggers See Statsbomb for example has taken analysis methods devised for hockey, basketball, and football, and applied them to soccer stats. It is now possible to quantify the luck teams seem to have using a hockey stat called SPSV% (also referred to as PDO); to visually represent the quality of a player with radar plots, borrowed from basketball; and to measure a team’s capacity for playing the ball forward using yardage, like in football. These methods, new to soccer, make it possible to look at all manner of questions quantitatively. Just how bad is Team A’s luck this season? Can Team B’s successful striker be expected to keep this up? And precisely how good is Team C’s midfield at moving the ball forward? And is Lex Immers really as bad a player as his reputation would have us believe? As an attacking midfielder, Immers’ main job is to create scoring opportunities for his teammates. The capacity to do so is generally associated with players with more brains than brawn – subtle, intelligent players like Arsenal’s Mesut Özil. Read more about Özil here Traditionally, the statistic used to measure this creative capacity is the assist – the pass directly preceding a goal. Viewed this way, Immers is indeed a mediocre player. His mere three assists this season firmly place him at a lowly 46th place on the assist list. But luckily for Immers, assist statistics do not accurately represent his accomplishments – or those of any other soccer player for that matter. A simple example makes this clear. Let’s say Mesut Özil passes the ball just six feet to Olivier Giroud, when both of them are some 45 yards from the goal. It’s virtually impossible to score at this distance, but Giroud opts to shoot anyway. And lo and behold, he scores. The statistic result of this play is that Özil gets another assist to his name, even though his contribution was negligible. Now imagine the opposite: Özil makes a phenomenal pass to Giroud, who is open near the keeper, giving him a solid scoring opportunity. But Giroud shoots high and misses. Result: no goal, no assist. Özil’s phenomenal pass vanishes into the statistical void. A pass, in short, only becomes an "assist" if a goal follows, regardless of the quality of the pass. Fairer would be if a pass were assigned a value independent of its result. So whether or not Giroud scores off of Özil’s pass, the pass is awarded a fixed statistical value on its own merits. This is precisely what the new soccer statistic Expected Assists (ExpA) does. The method is simple. The Expected Assist value of a pass depends on how great a scoring opportunity it creates. The scoring opportunity depends on a number of aspects: distance (the closer to the goal the better), angle (the more directly in front of the goal the better), and whether the shot requires a header or a kick (you have less control with a header). The other players involved also influence the scoring opportunity. It is easier to score in a one-on-one duel with the keeper, for instance, than in a crowded penalty area. The quantitative value of each opportunity can be deduced from soccer history. Take a header directly in front of the goal and 12 yards from the goalline, a shot that has been attempted thousands of times. By analyzing the average outcome of this shot, the pass preceding it can be assigned a value. The pass off which Graziano Pellè scored the opening goal Watch Pellè’s goal here against Ajax, for instance, has a value of only 0.095 ExpA. This figure shows that a pass of this kind will only result in a goal 9.5% of the time. That makes sense for a number of reasons: the pass set up a header and it’s harder to score with a header, Pellè was relatively far away from the goal, the scoring angle was tight, the cross long. To identify a pass as a "0.095 assist" is much more precise than simply saying it was an assist or it wasn’t. And if you add up the ExpA values of all a player’s passes in a match, you arrive at that player’s total number of expected assists. 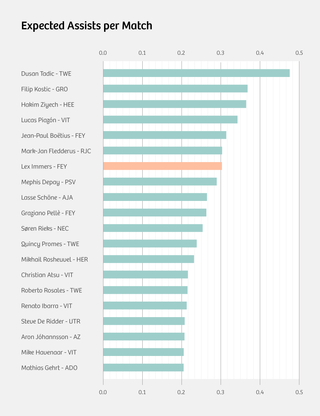 In the graph below, you can see which Dutch players create the most scoring opportunities per match, according to this measurement method. Apparently, Immers is far from mediocre in creating scoring opportunities. Only six players in the top Dutch league provide their teammates with more chances to score. But Immers has the misfortune that his teammates don’t always make the most of the chances he creates. Instead of the expected eight goals, they only scored three times: those meager three assists Immers has to his name. Subtle, intelligent player or not, Lex Immers is certainly a machine when it comes to creating scoring opportunities. Lex Immers, squanderer of opportunities? The image breaks down even further when we look at goals, the second of an attacking midfielder’s two main jobs. Immers scored a total of nine times this season. But just as statistics on "assists" are misleading, so too are stats on "goals". Take a player who makes 13 penalty shots and one regular goal. With a total of 14 points, he will end high on the season’s list of top scorers, but does this makes him a valuable attacker? Doubtful. But then how can we determine the true scoring capacity of a player? With "Expected Goals" of course, Expected Assists’ twin. While Expected Assists determines the value of the scoring opportunities a player creates, Expected Goals (ExpG) looks at the value of the scoring opportunities a player receives. Total ExpG is the number of goals we can expect from a player, given the opportunities Here you can see the number of goals actually scored (in Dutch) he has to score. The player with the highest ExpG in the top Dutch league is Graziano Pellè, in part due to the high quality passes he gets from... wait for it… Lex Immers. Immers himself boasts a scoring opportunity valued at 0.37 goal per match. What does this tell us about him? In any case, it tells us he has considerable opportunities to score, relatively speaking. That is certainly due to his teammates, but also thanks to Immers himself. It would seem his teammates like to pass the ball to him, or he somehow manages to be in the right place at the right time, or he cleverly maneuvers himself into open positions. This last element is an underestimated yet valuable quality. Watch this fantastic run Watch Immers’ run here Immers makes, before missing the scoring opportunity he creates for himself. With the scoring opportunities he had, Immers should have made 8.94 goals. He converted nine. So Immers is far from a squanderer of opportunities, an accusation often made not only by the media and spectators, but even by his own coach. "His conversion rate can and must improve," Feyenoord Manager Ronald Koeman is quoted as saying in the Dutch daily newspaper known for its extensive sports section, Algemeen Dagblad. This from the man who gets paid to assess Immers. The Feyenoord player you could consider accusing of a lackluster conversion rate is star player and top scorer Pellè. After all, he had scoring opportunities to the tune of 21.8 goals, but converted ‘only’ 20. However, it is highly questionable whether this says much of anything about Pellè. The best strikers in the world, Lionel Messi and Zlatan Ibrahimovic, have scored fewer goals this season [the 2013-2014 season, MdH] than one would anticipate from their Expected Goals stats. The main difference between good and bad players is not that good players are better at converting scoring opportunities into goals. So what sets good players apart? Good players create more and better scoring opportunities for themselves. Lionel Messi and Zlatan Ibrahimović do a tremendous job of this. 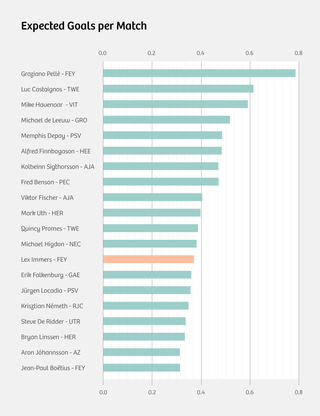 And Lex Immers does well above average. Statistics suggest that Immers is one of the best players in the country. He performs his main jobs of passing and scoring with above average proficiency. Ditto for his additional tasks: Immers runs a lot, tackles a lot, and intercepts a lot of balls. And all of this he does throughout the season as he is seldom injured. Yet Immers is still seen as "not good enough for a top club like Feyenoord." Part of the answer is that Immers’ strengths are not always evident; some even come disguised as weaknesses. Immers rarely scores spectacular goals, for instance. But that indicates another strength: it means Immers rarely shoots from unlikely scoring positions. Marco van Basten’s shot against to Soviet Union in the European Championship final of 1988, which brought the score to 2-0, is an unforgettable goal, Watch Marco van Basten’s legendary goal here but the ExpG was close to zero. A rational player would have taken the ball and passed it. Van Basten later explained he was too tired to pass and took the shot instead. Immers is the kind of player who would make the effort to pass – tired or not – and that’s why he scores so high in the Expected Assists stats. Another, likely larger, part of the answer lies in Immers’ style. He simply does not look like a good player. He is too tall, too gangly, too scrappy, too… what’s the opposite of agile? That may all be irrelevant, but it’s a well-known fact that unattractive baseball players used to be undervalued, as the book Read an except from Micheal Lewis’ brilliant book here and film Moneyball Watch the Moneyball trailer here captured so brilliantly. Is soccer really all that different? The Oakland A’s General Manager Billy Beane profited from this phenomenon by finding such players using statistical analysis and then contracting them at reasonable rates. Thin, fat, clubfooted, with warts – it was all good in Beane’s eyes, as long as they scored runs. Soccer can learn from this approach. Immers is an extreme example of an undervalued player. And now that players net millions, even a shade more insight into their true value can save a club loads of money. For the players themselves, statistical analysis can be life-changing. The players Oakland identified using statistics had been destined for anonymous careers. Many had come to believe the myth of their own mediocrity, until Beane came along and uncovered their true worth. We cannot ask Lex Immers what he thinks of his own game. Feyenoord does not allow reporters from online media to interview players. But he told Spits interview with Immers (in Dutch only) the Dutch free daily newspaper Spits he was sick and tired of the criticism: "I can’t even go to the grocery store with my kids anymore." Players like Lex Immers will just have to wait until the Billy Beane of soccer steps forward – someone who understands that hard workers can make phenomenal through passes, and that something as unremarkable as a clever run can yield spectacular results. Like we saw in the February 2014 match between FC Twente and Feyenoord. Just three minutes in, Twente’s goalie gets the ball and Immers sprints toward him – to all appearances a play without a chance. But Immers’ timing is perfect. Marsman panics and Immers manages to wrest the ball from him. It looks as if he might score, but then he’s brought down. Watch the footage here The result? A red card for Marsman, a penalty kick for Feyenoord. At least, that’s what would have happened had referee Serdar Gözübüyük seen any of it. But like so many others, the referee could not appreciate what Immers was doing. He most likely did see what followed, however, clear as it was to all of us: a furious Lex Immers, kicking and cursing and gesticulating wildly, like the bad player he is not.